TraceMyIP provides a wide range of EU GDPR compliant website statistics and analytics services to assist a webmaster in managing web presence. Unlike self-hosted web stats solutions, with website analytics tools from TraceMyIP, a webmaster can manage simultaneous statistical evaluation of multiple websites under the same TraceMyIP account. 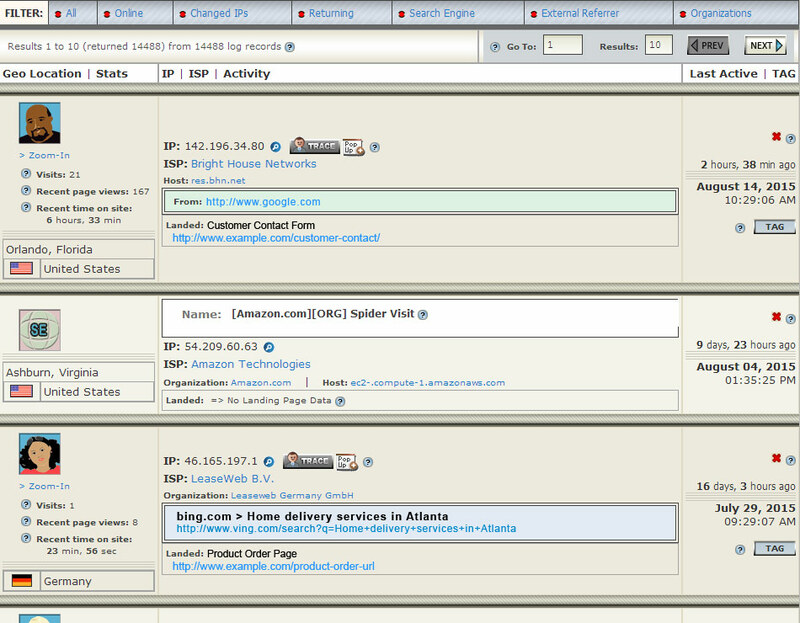 Entire real-time website traffic summary of all website projects are displayed on the same dashboard page. One of the features of hosted analytics by TraceMyIP is the [summary of projects] report. 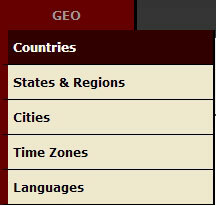 This report provides essential information of all website projects being monitored on the same page. This page is updated in real-time per time interval set by a webmaster and provides information such as how many users are currently browsing each website, pageloads graphic chart that represents a website traffic flow and a number of total page loads for the current day, yesterday, last seven days, last month and total number of visitors currently browsing each website. 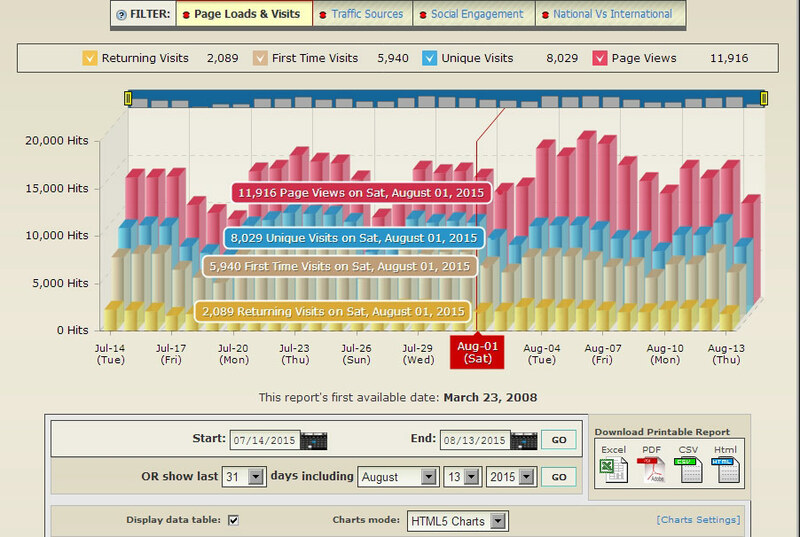 This report can also be configured to display a second row of summary stats, which can show either website unique or first time visits information. Unlike self-hosted website analytics platforms, hosted statistics software is updated immediately should any issues arise, helping web publishers to concentrate on work and not on technical performance of web analytics software. There are other advantages of hosted vs. self-hosted web analytics. Hosted web traffic evaluation trackers significantly reduce the CPU load on the servers that host publisher's content, save data on a dedicated hardware storage independent from the content storage. And unlike self-hosted statistical software packages, services hosted by TraceMyIP offer free online technical support available to members 24x7. Additional highly configurable EU GDPR compliance tools make it significantly simpler to manage the compliance and get the most benefits from statistical data collection without breaching the law. Advanced website analytics reports can be accessed by either clicking on the pie chart graphic icon to the left of each project's name or the website project report menu items located under each project name (configurable by user). The main web analytics report menu provides selection of essential reports such as Campaign Tracking, Link Tracking, Page Tracking, Daily Hit Stats, Campaign raw traffic log, Keywords Analytics, Came From Stream, Raw Page Loads Log, Web Visitor List and Web Visitor Map. The aggregated web analytics logs provide essential info about Traffic, Individual Pages, Web Visitors, System Platforms and Geographical data. All of the data provides in-depth information on website traffic from a real-time web analytics engine. Subject to General Data Protection Regulation (GDPR) (EU) 2016/679 directive, all data can be completely customized to scale to the existing EU GDPR requirements. 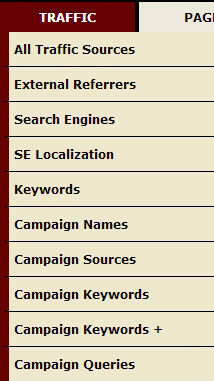 The campaign analytics reporting allows webmasters to track each individual advertising campaigns from vendors such as AdWords, Bing Ads, BuySellAds, AdRoll, 7Search, Infolinks, Kontextua, DNTX.com, AdLandmark, Sponsored Tweets, ADsmonster and man others. The	Campaign Tracking report provides advanced information about advertising PPC or PPM campaigns, affiliate programs, referrals and advertising costs. The campaign report gives access to other in-depth reporting, which includes but not limited to individual visitor activity tracking, preset campaign clicks, raw data on page views, campaign link abuse and suspected fraudulent activity, conversion data and total earnings. The HTML5 based charts (user switchable to Flash Charts) are individually renderable for subdivided reports which include Conversions, Bounced Visits, Click Stats and Conversion Earnings. These graph renders can be further drilled down to a yearly, monthly and daily timeframes. Solo Link and Solo Page Trackers. Both tracking tools are separate individual tracking modules that are seamlessly integrated into each project set of analytics tool. These tools go beyond analytics by enabling webmasters to interact with web visitors by creation of conditional action rules. For example a TraceMyIP.org user can create a rule based on a specific visitor data to redirect the visitor or show a popup message to the visitor. Other options include visitor blocking and transitional messages. 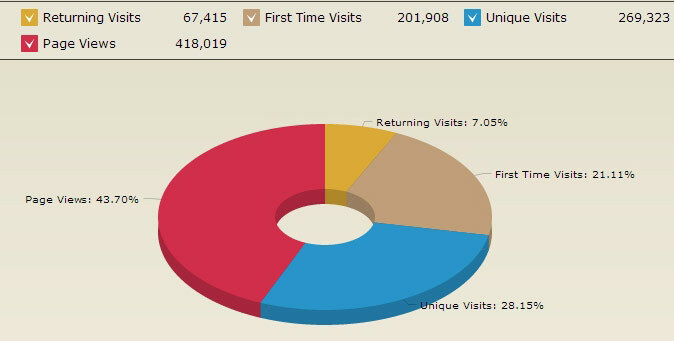 Daily Hit Stats report renders a visual representation of page loads, first time, returning and unique visits from the very first date the analytics project is started. This log retains unlimited data for basic and premium accounts. The visual representation is rendered in the form of graphic charts that offer customizable views and date ranges. The charts are zoomable and can be quickly focused on any given time and date range. The graphic chart data features quick filters that allow switching the analytics charts between Page Loads & Visits, Traffic Sources, Social Engagement and National vs International visitor traffic. The graphic charts can be further switched between Discrete and Proportional views for a more appropriate graphical data representation. Hourly reports provide a graphic chart representation of hourly page load and visit statistics that is measured on an hourly basis. This report can be used to measure real time and recurring traffic from advertising campaigns where a specific timeframe of the day is observed. 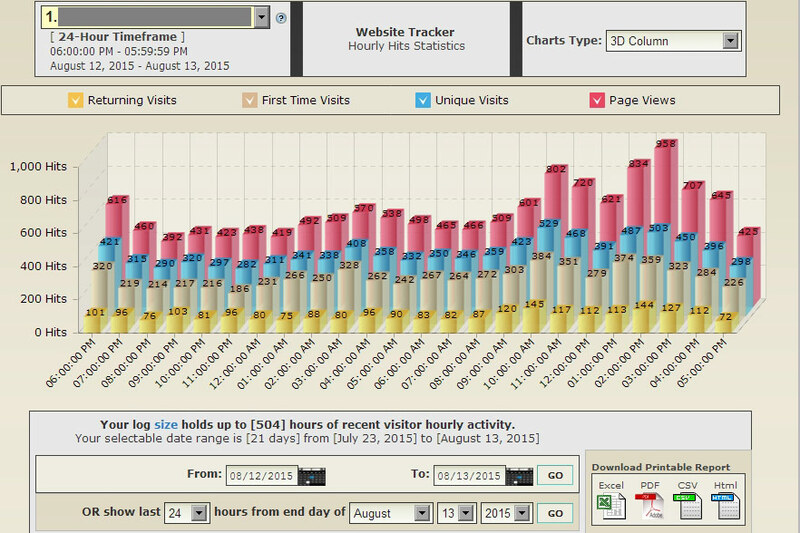 Other uses include hourly page load and visit summary stats and website uptime monitoring. Search Engine Keywords analysis gathers all possible keyword data sources utilized across all search engines. Although the Google's keywords data might be somewhat limited due to the decision to secure keywords data, all available search engine keywords data is reported on this keywords analytics report. It provides a searchable analysis of all search engine keywords that deliver traffic to a website. "Came From" report (URL Referrers) delivers a searchable list of all referrers that brought visitors to a website. Each referrer entry tracks individual visitor identification in form of an IP address, geographical location, computer system utilized, referring URL address and landing URL address. 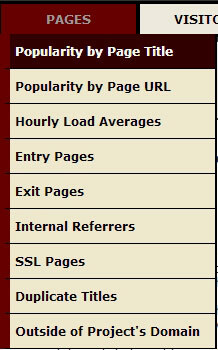 The Page Loads Log analytics lists data about every website page requested. It includes website visitor identification data such as ISP, Organization, IP address, physical location, browser and OS data, search keywords data, referrer and landing pages and more. It also provides a webmaster with tools to tag the visitor and track the visitor regardless of an IP address, which allows tracking a visitor's IP address changes in real time. This is the most extensive log that also is highly configurable with EU GDPR compliance tools. 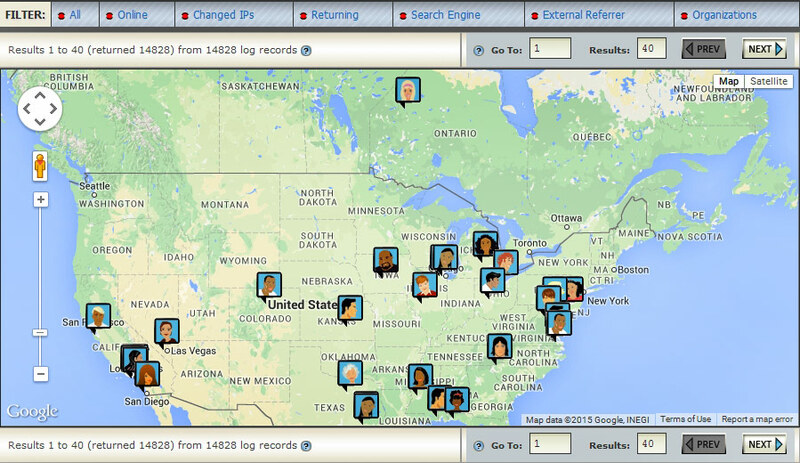 This log and other logs, also allow web publisher to add searchable notes for each page load. The Visitor List Log shows a comprehensive list containing the most essential data about each single website visitor (not available in Google Analytics). 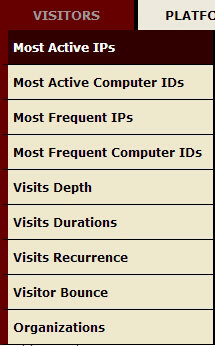 The information about each visitors consists of indication if a visitor is currently online, how many visits and pages were viewed by each visitor, personal geo information, ISP and Organization data, initial website referrer, ISP host, recent time spent on site and address book data associated with a particular visitor. The advanced drill-down filter provides options to search visitors that recently changed their IP address, referred by a search engine, came from networks originating within Organizations, and/or currently are actively browsing a website. 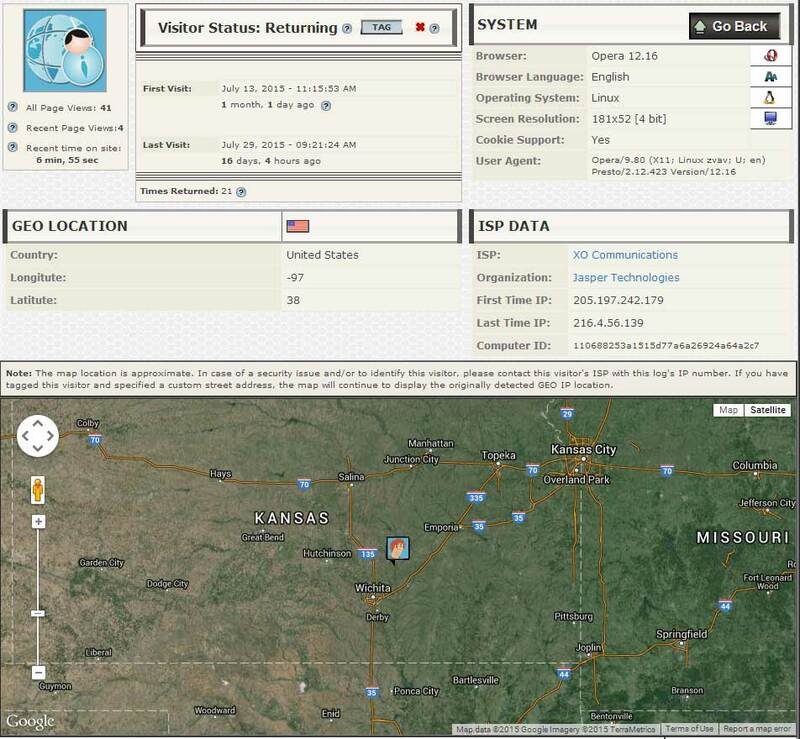 Visitor Map View generates a geographical overview of all individual visitors that are currently stored in a real-time visitor log. Each visitor's icon on the map is clickable, which allows a webmaster to further drill-down on each visitor's information for further analysis. The map view is customizable and allows for zooming, satellite and basic road map views. Visitor Details. 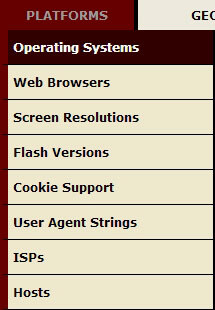 The system provides a dedicated page for each website visitor. The page serves a detailed stream of data reflecting on visitor's web page loading activity, the time spent on site, each page view time and associated address book tagging information. Geo Location - provides publicly accessible (as provided by visitor's ISP) geographical location, and includes longitude and latitude. Aggregated web-analytics reports allow producing statistical reports on the entire data stored for each website that's being monitored. The statistical reports provide more in-depth information on visitor flow and how it affected the website traffic data over time. Aggregated web-analytics reports always stay the same and are not affected by EU GDPR compliance tools. Advertising Campaign traffic sources by keywords, name and search queries. * Availability of computer IP and ID data is subject to EU GDPR compliance tools configuration. * GEO visitor information is a subject to EU GDPR compliance tools configuration. More reports are available as drill-downs. All data is acquired instantly without a single second of a delay. Install a website statistics TraceMyIP tracker code to start gathering your website visitor analytics information right away.